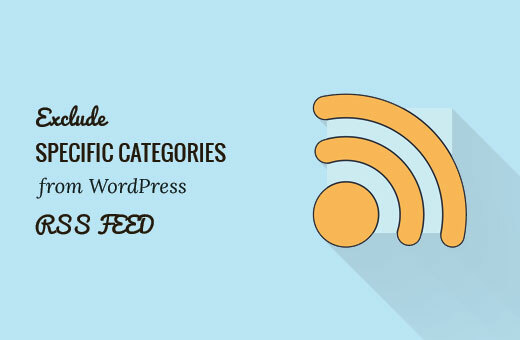 Do you want to exclude specific categories from RSS feed on your WordPress site? Many site owners use some categories for content that they don’t want to appear in the RSS feed of their site. 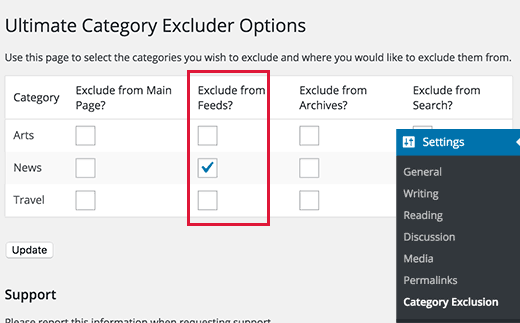 In this article, we will show you how to exclude specific categories from WordPress RSS feed. First thing you need to do is install and activate the Ultimate Category Excluder plugin. For more details, see our step by step guide on how to install a WordPress plugin. Upon activation you need to visit Settings » Category Exclusion to configure plugin settings. The settings page will display all categories on your WordPress blog with options to hide them from front page, RSS feeds, archive pages, and search results. Simply select the exclude from feed box next to the categories that you want to exclude from your RSS feed. Don’t forget to click on update button to save your settings. That’s all, posts filed under your selected categories will disappear from your WordPress RSS feed. This method requires you to paste code in your WordPress files. You can use this method if you are comfortable with pasting code snippets from web into WordPress. You need to add this code to your theme’s functions.php file or a site-specific plugin. This code simply excludes categories that match the given IDs. Simply replace the category IDs in the code with the IDs of categories that you want to exclude. See our guide on how to find category IDs in WordPress. Replace -15 with the ID of category that you want to exclude from RSS feed. 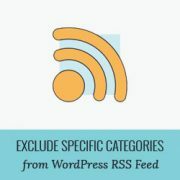 We hope this article helped you learn how to exclude specific categories from WordPress RSS feed. You may also want to see our list of 10 most wanted category hacks and plugins for WordPress. cool trick, thanks for sharing! Please, i’m ardent reader of your site. How can i re-order my feed post using category id?